In November 2005 one railfan was issued with an infringement notice simply for holding a camera on a platform. The bit you DIDN'T bold was extremely relevant, so I have bolded it here. The words "citation needed" means this allegation has not been proven to be true. AFAIK, Trolley Bus Racer, it's been established that there is no legal requirement for one to partake in Connex's permit scheme. jb17kx wrote: AFAIK, Trolley Bus Racer, it's been established that there is no legal requirement for one to partake in Connex's permit scheme. If a staff member ever gives you trouble just tell them to call the police. I know it hasn't been proven, but a Flinders Street station staff member had a go at me for just holding a camera while entering the ticket gates. 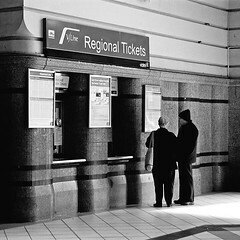 Newcastle Flyer wrote: I know it hasn't been proven, but a Flinders Street station staff member had a go at me for just holding a camera while entering the ticket gates. I've walked through those gates hundreds of times with a camera. I will have to admit Ive taken more train photo's over the years then bus pic's and found it alot easier getting train pic's then Bus pic's, as I personally think train driver's are kind of use to people photographing trains and know there just "Train Buffs" and are'nt a threat. Ive had issue's on stations where ive been told to leave by SM's and even cops. Around Sydney its starting to get a little harder where you can be standing on the right side of the fence then bloody cops turn up.. this has happen to me twice at Chullora and surrounding area's. Now I only do the occasional trip to the area for trains other then that I leave it to the Hunter Valley where ive never had any troubles and even the Police and Transits are friendly to you and even ask you seen anything good? Alot of driver's are ok with it and understand that I have an interest in buses although you still get strange looks which doesnt bother me the slightest. I agree with you David Sydney bus driver's are the worst.. and find they will actually stop there bus and say why are you photographing me? I reply im not im photographing your bus.. its as simple as that but thats not good enough for these weirdo's who are so paranoid I question if they should be driving a public buses . I just ignore the whole lot of them and click away to my hearts content. I've been doing it now close on to 40 years and don't intend to cease now. Even those pesky security guards at certain bus depots don't deter me. leopard1543 wrote: I just ignore the whole lot of them and click away to my hearts content. We (another person was also taking pictures) tried to ignore a bus driver, yet he steps out of his bus, walks over to us, says something, then says "A lot of laws have changed since, . . . then goes and & says it's illegal to take photos of buses. I asked him "Please show us in writing were it says it is illegal to take photos of buses." I then mentioned okay then I will go to the CEO/(Not sure of exact title this person has, but I think it might be general manager) & ask that person of as bus depot. He claimed that this "direction" came from the CEO/GM. Before that happened, I stood out of the way while someone else was taking pictures, and a bus marshall said "Can I help you". I just I'm right thanks, I'm just standing out of the way while that person takes pictures. She must have misheard me, and said sure you can take pictures. This is a major problem in the UK & has had a good airing in the press. There has been a petition to No 10 Downing Street, all fruitless. I was stopped in 2005 in the company of a chap who was taking cine films of the last Routemasters on Route 36. The MI6 building, it turned out was on the other side of the Vauxhaul Bridge. We were at this location as 2 routes crossed. We pointed out to this prat that to film the building from where we were was into the sun to start with. An Austrian Tourist filming buses at the bus station nearer the imfamous building had his pictures deleated. The UK has more CCTV cameras than any other country. It is tough being an enthusiast in a police state.The Austrian incident bacame a major one & was a disgrace. And I think the moral of this thread is, "if you want legal advice, don't ask a bus driver". Neither the Federal nor the State privacy laws regulate the behaviour of individuals; they regulate the behaviour of government and business organisations. So the privacy acts would have no bearing on whether or not an individual can take a photograph of a bus, unless that individual was taking the photograph for a government or business organisation. It is interesting to note that Privacy NSW (the Office of the NSW Privacy Commissioner and the body which administers the Privacy and Personal Information Protection Act 1998 of NSW), where a complaint about invasion of privacy involves a private individual rather than government or business, suggests that complaints involving neighbourhood disputes be dealt with by mediation at a Community Justice Centre and that anyone needing advice about other matters should get their own legal advice to see what avenues are open to them. Stalking, harassment, nuisance and trespass come under the Crimes Act 1900, as does "voyeurism and related offences". It is extremely unlikely that photographing of a bus would fall into one of these categories, but if it does, you could find yourself talking to the Police. And if you were taking a video with sound, then there is always the possibility that the Listening Devices Act 1984 could come into play. It is possible to invade someone's privacy in a public place (and I'm not just referring to voyeurism, which has a whole division of the Crimes Act 1900 to itself). A person who appears, without their consent, in a published photograph of a crowd scene, or appears incidentally in a photograph, cannot complain of an invasion of their privacy, but they can complain if they constitute the real subject matter of the photograph, even if it was taken in a public place. While I was out last week at Bankstown Square Shopping Centre in Sydney, I decided (as I have done on so many occasions in the past) to take some random photos of buses that were there while I had some spare time. After taking a photo of a Veolia Volgren, I was harassed by the driver who's face had appeared in the photo asking me what authority do I have to be taking photos. I politely replied that I'm a transport enthusiast & take photos as a hobby. And furthermore, no such authority is needed as it's taken on public land. After reporting the incident to a representative from Veolia, I was informed that if I wish to take a photo of a bus with a driver's face appearing, I need to ask their consent first due to the privacy act. What if the bus is moving This comes as a complete surprise to me as only 2 weeks earlier, I was at the Bay Village Bus Terminal on the Central Coast taking photos of buses there. While there, I started chatting with an inspector from Red Bus Services who was most helpful & courteous with my hobby & didn't have a problem in the world with what I was doing. After seeking legal advice from a solicitor, I was told that the Road Transport Act (NSW) had been amended recently due to car driver's faces appearing in photos taken by red light & speed cameras and that the same kind of privacy issues were being raised. I would suggest that these Veolia staff don't know what they're talking about and are making things up as they go along, in order to justify their stance on the matter. Federal and NSW Privacy legislation does not apply to photography by individuals. The legislation only covers photography by Government departments or large corporations (and, by extension, persons working on their behalf). The only legislation in place that I am aware of that regulates photography by individuals relates to voyeuristic photography or intimidation or harrassment (in the Crimes Act 1900 I think). If the Veolia staff are so sure that the privacy legislation has any such provisions, maybe someone should ask them which Act they are talking about - the Privacy and Personal Information Protection Regulation 2005 of New South Wales, or the Privacy Act 1988 of the Commonwealth - and what section of that Act contains the provisions they are referring to. Somehow I don't think they would be able to answer the question. Are there any solicitors on this forum who could comment further? 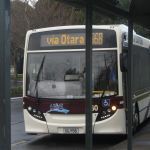 Mark wrote: After reporting the incident to a representative from Veolia, I was informed that if I wish to take a photo of a bus with a driver's face appearing, I need to ask their consent first due to the privacy act. According to their reply, they didn't actually say that you are not allowed to take photos, just the information about the driver's face appearing. Did you let them or the bus driver (after he asked what authority etc) know that you are taking photos of buses and not the drivers, and did you print that document about photography that appears somewhere in this thread? Mark wrote: After taking a photo of a Veolia Volgren, I was harassed by the driver who's face had appeared in the photo asking me what authority do I have to be taking photos. I politely replied that I'm a transport enthusiast & take photos as a hobby. And furthermore, no such authority is needed as it's taken on public land. If he continiues being stroppy just tell him you don't want his ugly head in the picture either! Alternatively you could have a full head monster mask with you and tell him here put this on,it would be an improvement. Well no, so called security guard (who had no ID - only a vest), you can not ask me what I am doing, especially since I was on the public roadway. If you are a security guard, your "power" only extends to the boundary of that shopping centre. How long before our NSW Police friends think of such a register? This is my first visit to London, so the mood is very excited. Refering to my post on page 2 here: viewtopic.php?p=316660#p316660, but the links may not work, althought the documents still exist. Since NSW now has a new government, I wonder if that now voids those documents in those two links in my post. Not unless the new government issues new documents/ policies. But say a person taking a photo of transport (be they enthusiast or not) has that doucment printed and say a transit officer claims you're not allowed to take photos of trains (or bus if say a bus transit officer), that person then shows the document saying that photographing transport is allowed, wouldn't a possible reply by the transit officers "Yes, but NSW now has a new government, therefore those documents are no longer able to be used", even if the new NSW government doesn't issue new documents? they could say it - but they would be talking crap. He informed me that while he was on a TransdevTSL route service (I forget the exact street name) doing 60 kilometers an hour, someone has come out from 2 parked cars with their tripod, taken a few photos & scuttled back to the footpath. The driver gave a re-enactment of the expression on his face in the photo would look like. A brief description is him heavily applying the breaks with a I hope I don't hit the photographer look. Now while the act of photography is not illegal, surely endangering the lives of the public around us is & a bit of thought needs to be taken when we photograph buses. Surely nobody here wants their last ever photograph to be of a bus seconds before it runs you down.